Polish virtuoso pianist and composer. Photograph Signed, "I. Friedman". Not dated [but an accompanying letter from the agents Van Wyck indicates that it was mailed from their London office on 7th March, 1938]. Approx 9.75 x 7.5 inches (25 x 19 cms). Some surface damage to right edge and with mounting traces to verso. VG. A nice pensive portrait of Ignaz Friedman, showing him in head and shoulders profile, looking to his left with serious, thoughtful expression. Considered by most critics and musicians alike to have been one of the great piano virtuosi of his generation. 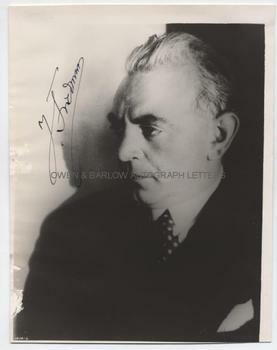 Autograph material of Ignaz Friedman is decidedly scarce and his is probably the rarest of all the 20th century's virtuoso pianists.